In a global context in which we are keeping high attention to environmental impact and to the costs of the energy spent in chemical analysis process, the Spectroscopic Analytical Chemistry started researching analyses and increasingly accessible analytical methods, of low cost, fast and adaptable even for those not specializing in laboratory techniques. A practical example is represented by CDR FoodLab® analysis systems which specialize and optimize the use of photometric technology in terms of costs, of the amount of reagent used and of time. CDR FoodLab® analysis systems are based on “micromethods”, involving the use of small quantities of the samples used for the analysis: as consequence we have a significant decrease in the consumption of chemical and biochemical reagents. Comparing “micromethos” with traditional reference methods, they determine a considerable reduction of waste to be disposed. Moreover, combining the micromethods with the optimization of analytical procedures, thanks to the use of pre-dosed and ready-to-use reagents, allow to make quality controls directly on the food production line and no longer require the transfer of samples to remote laboratories. As consequence, micromethods allow to save time and increase the efficiency of control, especially in the measurement of dynamic parameters in rapid evolution as in oxidative processes. As shown by the study of olive oil samples from the Laboratory of Analytical Chemistry of the University of Athens, the simplification and the low energy impact of the analytical protocols allow to develop new techniques of appreciation of oxidative stability, as an alternative to the traditional methods. If applied on production chain, these techniques determine as a result the improvement of the quality level of the food product. The developement of rapid measurement methods of biophenols content in extra virgin olive oil, was found to have a very good correlation with the international reference methods. The topic was broached by Professor Massimo Innocenti from the Department of Chemistry – University of Florence, during the ISA Conference in Matera, from May 29th to June 01st 2016. Precious contributions to the speech of Professor Innocenti, were given by Dr. Simone Bellassai, Dr. Simone Pucci, Dr. Paolo Giusti, reaserchers of the chemical laboratories in CDR. The ISA Conference is a traditional event of the Analytical Spectroscopy Group (GSA) of the Italian Chemical Society, and is aimed at researchers working in the academic, public and private institutions, interested in the state of the art in the field of modern spectroscopic techniques and their advanced applications in chemical analysis. ISA2016 consists of plenary lectures, oral communications and posters. The meeting is open to contributions from all areas of interest of the Analytical Spectroscopy. This edition is organized by the University of Basilicata, the University of Bari “Aldo Moro” and by the Società Chimica Italiana (Italian Chemical Society). 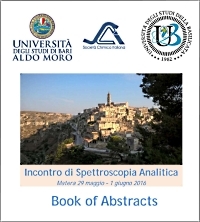 If you want to read the complete speech of Professor Innocenti and all the abstracts of the ISA Conference, click on the link: ISA2016 book of abstracts. Spectroscopic analyses of foods with a low environmental impact – ISA Conference 2016 was last modified: March 6th, 2017 by CDR s.r.l.